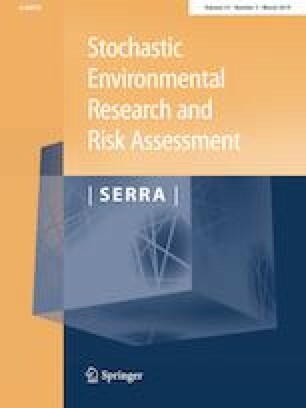 A performance-based modeling framework is developed to estimate three attributes of the risk of Total Ammonia Nitrogen (TAN) permit limit violations: probability, magnitude and frequency of violations. Discharge Monthly Report data from a sample of 106 US municipal treatment plants for the period of 2004–2008 is used for the analysis. A Generalized Linear Model regression produces estimates for the probability and frequency of TAN discharge violations, using logistic and Poisson distributions, respectively. The expected magnitude of violations is modeled as a non-stationary Generalized Pareto Distribution (GPD), using Extreme Value Theory. Regression covariates are plant inflow, fractional use of design hydraulic capacity, seasonality and previous month’s performance. The logistic regression model of the probability of a TAN violation has a median Brier Skill Score of 0.25, while the Poisson regression model of violation frequency has a median of 65% correct prediction in validation. The GPD model has equivalent model and empirical quantiles. Model predictions of probability and frequency are combined to obtain two composite risk indices—the Estimated Violation Index (EVI), which is the product of the average probabilities of violation and frequency at each location, and the Estimated Severity Index (ESI) which is the product of the EVI and the predicted 2-year return value of discharge TAN concentrations above the regulatory limit. Spatial maps of ESI and EVI provide visual guides for regulatory agencies to identify risks and prioritize compliance and enforcement efforts. This research was a part of the activities of the Center for Comprehensive, optimaL and Effective Abatement of Nutrients (CLEAN) and was funded by USEPA Grant 83557001. Its contents are the sole responsibility of the grantee and do not necessarily represent the official views of the USEPA. Further, USEPA does not endorse the purchase of any commercial products or services mentioned in the publication. Work by the first author was partially supported by the Department of Civil, Environmental and Architectural Engineering at the University of Colorado Boulder through a Doctoral Assistantship for Completion of Dissertation. We also thank Dr. Scott Weirich for providing ICIS data and R-codes and Dr. Carleigh Samson for her valuable advice. Special thanks are due for our (anonymous) reviewers, whose highly insightful comments helped substantially improve the manuscript. where yk = kth probability forecast obtained from logistic regression model ok = kth binary observation (1 when event occurs, 0 otherwise). BSS values have a range of –∞ to 1. Negative and 0 BSS values are undesirable, indicating the model predictions are worse than and same as the climatological forecasts respectively. Positive BSS values are desirable, and closer the value is to 1, the better the prediction is deemed.